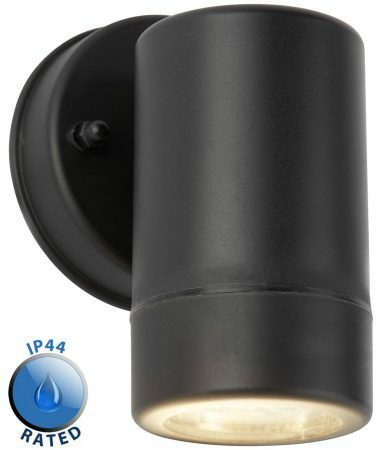 This Mellor rust proof outdoor wall down spot light in black is rated IP44 making it weatherproof. When fitted on an exterior wall it will light the area below with a pool of light to help visitors find their way. Manufactured entirely from polypropylene, this exterior light will not rust and only requires a wipe over with an oily cloth to maintain its good looks. Ideal for coastal locations or any other harsh environment. Please note: This outside light must be fitted with an LED GU10 lamp bulb (not supplied) up to a maximum of 3w that last for years and cost pennies to run. Halogen lamp bulbs must note be used. Fit this exterior light next to your front door, next to a pathway or patio to provide a pool of light on the ground. A great way to ensure that your outside space is secure after dark and at a great price too.